How to zone a bathroom unit including WC without any layout changes? 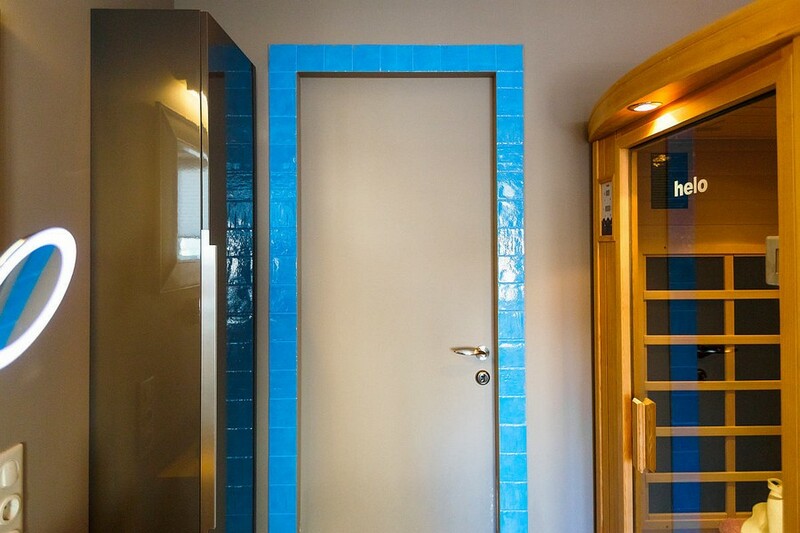 Can a full-fledged sauna be arranged in a common city apartment? 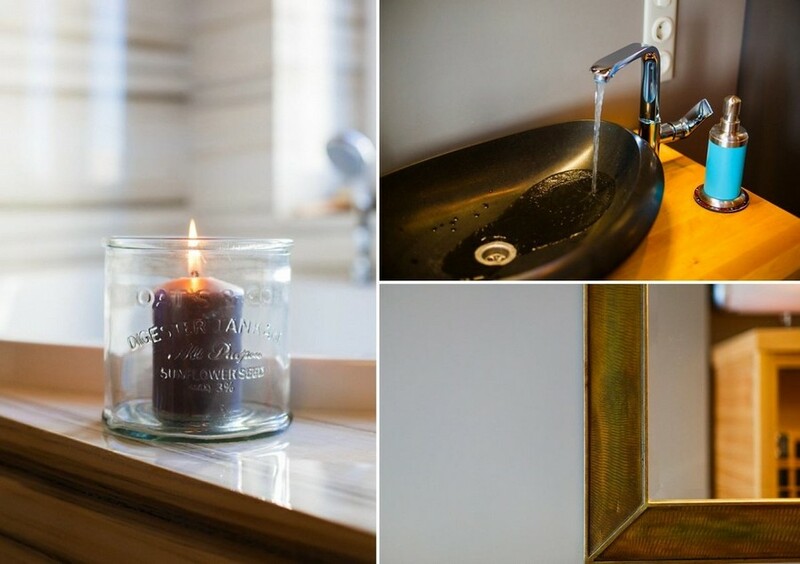 How to dress up a big window a bathroom has? The answers to these and many other questions can be found in our post. 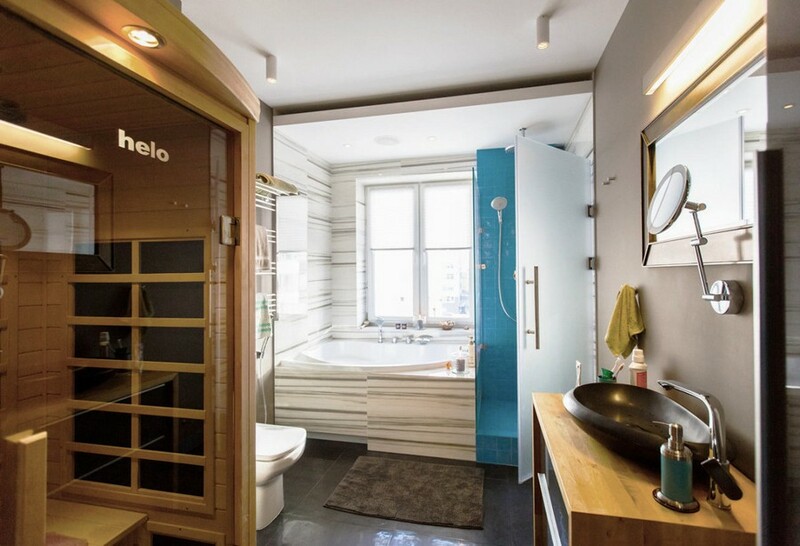 Having a bathroom with a big window in a typical city apartment is an exception rather than the rule. Especially when it’s a house constructed before World War II. And when it has a total area of 7.7 square meters, this sounds like a miracle. The owners of this flat – the newlyweds – paid much attention to these two factors when they were looking for a future family nest. 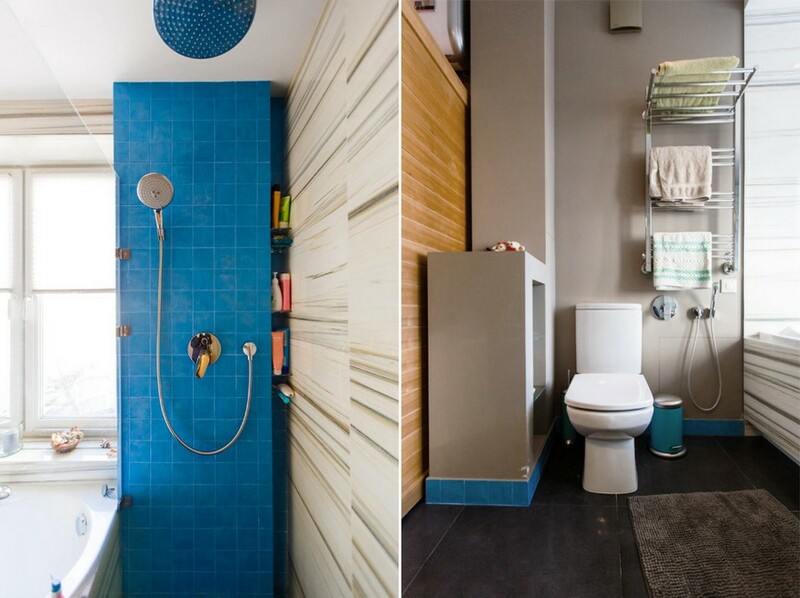 The entire apartment was totally re-planned, but the bathroom was kept in its original form. Right at their first meeting with the author of the interior design project the masters announced they baldly wanted to have a home infrared sauna installed in the bathroom. Besides this quite non-standard wish, they wanted a separate walk-in shower, a roomy vanity unit and at least one more storage spot, a toilet, a hygienic shower, a water heater and a built-in acoustic speaker. To make all of these dreams come true, the architects had to increase the total bathroom area a little bit (up to 8.1. square meters) by cutting the corridor, but its rectangular shape was successfully preserved. 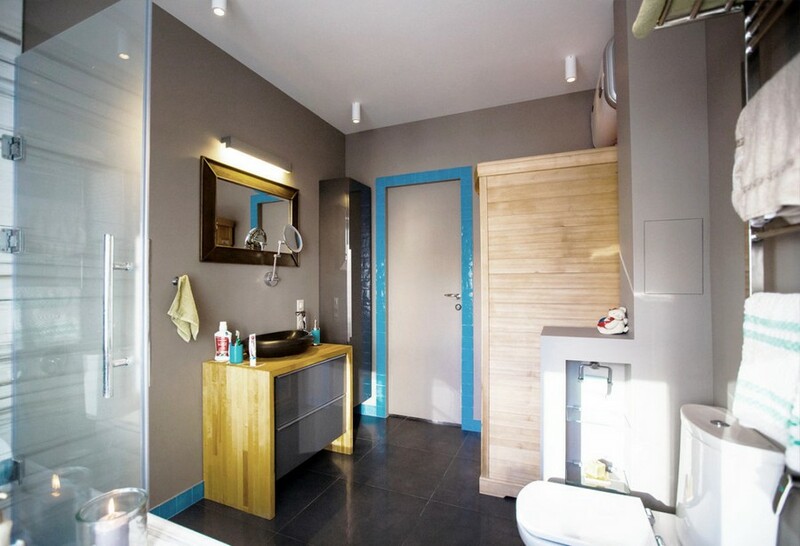 In a bathroom unit including WC functional and visual zoning of the space plays a great role. The architects managed to divide the room into functional areas by means of finishing materials. The most eye-catchy part of the room is the so-called “wet zone”: a drop-shaped bathtub by Kolpa San Amadis and a walk-in shower adjacent to it are accentuated with ceramic tiles of different formats and textures. The ceiling above this section was dropped for the sake of building in ceiling lights, a tropical shower head and an acoustic speaker that plays music when someone takes a bath. The walk-in shower is physically separated from the bath with a glass partition and visually – with contrasting small tiles in azure blue. The same tiles were used for finishing the flush shower tray, the doorway and a peculiar baseboard along the perimeter of the room. The bathtub zone is by contrast faced with light large-format tiles imitating marble texture. The windowsill level didn’t coincide with the bathtub upper edge, but the architects turned this fact into an advantage. Faced with the same faux marble tiles, it now plays the role of a shelf for storing versatile bathroom accessories and cosmetics. A faucet and a shower head are built into the bathtub rim, and the window is dressed up with pleated blinds. The rest of the walls and the door are coated with waterproof paint of milk chocolate tone, which brings together the two contrasting wall tile types and ceramic granite laid on the floor. 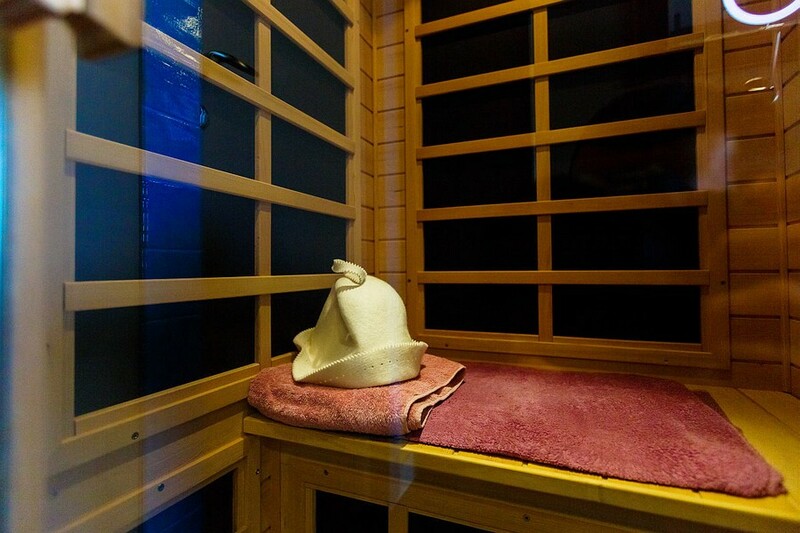 An infrared sauna in an apartment: possible or not? To implement the idea of a walk-in infrared home sauna the architects had to sacrifice a part of a corridor area. 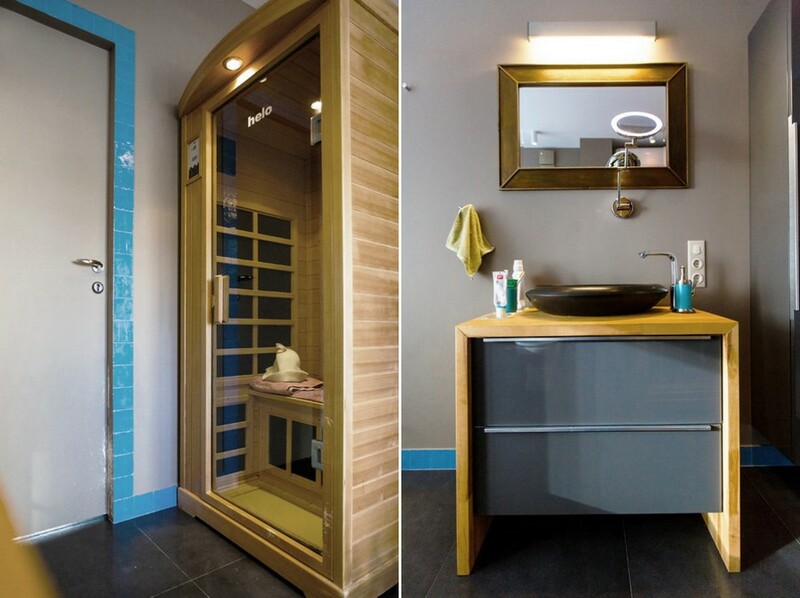 All the technical systems are concealed in a small partition separating the sauna from the toilet. A good bathroom interior design project as a general rule doesn’t show up the toilet immediately on entering the room. The same is true about this room: to conceal the toilet bowl by Roca Element, the above-mentioned partition was lengthened with a sheetrock construction and equipped with a few glass shelves from the WC side, which play the role of a bonus storage area. Mounted above the sauna was a water heater, which is practically invisible. The opposite wall features a partially handmade vanity unit crowned with a top-mounted drop-shaped sink made from natural basalt, which matches the bathtub form. 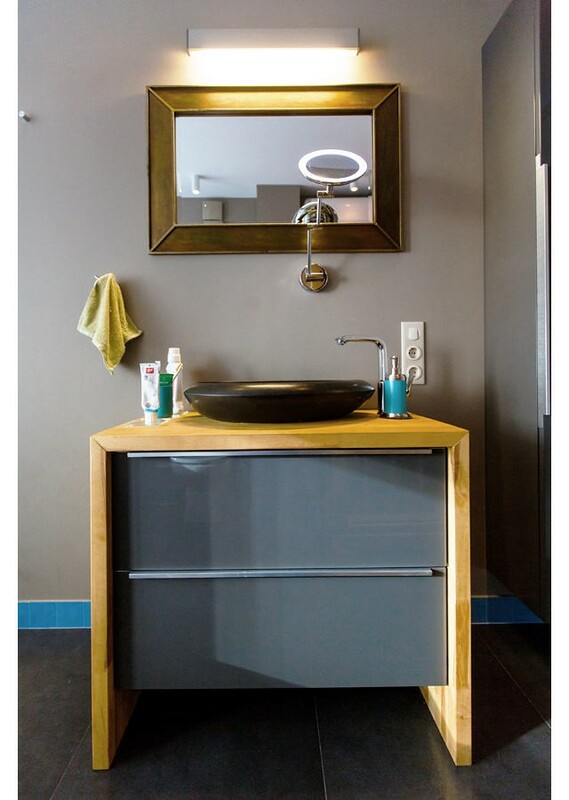 A common IKEA wash basin cabinet was faced with a wooden countertop and thus changed almost beyond recognition. Also, there is an elegant tall wall-mounted cabinet, which is the bonus storage zone the hosts wanted so much. 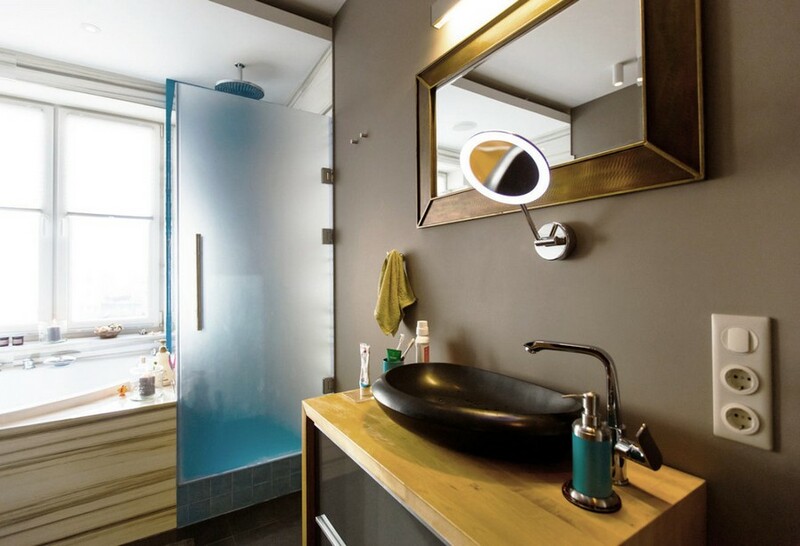 An ornamental mirror above the sink is complemented with a functional wall lamp by SLV. If you’re a lucky owner of an apartment with a free-pattern planning, pay special attention to your corridors – there’s a great chance that you can legally enlarge your bathroom by cutting the hallway partially. Don’t hesitate to drop the ceiling in the shower cabin: it’s a good way to build in a tropical shower head and ceiling lights. Built-in wall recesses in bathroom and shower zones are always better than bathroom racks both from practical and aesthetical aspects. Wall tiles are recommended for wet zones only; in other parts of the room you may safely apply waterproof paint. It’s a more interesting and money-saving solution. If your bathroom is regular-shaped, with no redundant buttresses and ledges, feel free to accentuate different functional zones with versatile materials and tiles of different formats.